From the cities of La Rioja and Córdoba, stay on route 38 reaching Patquia. After crossing this town, take route 150 and proceed to route 76 headed towards Villa Unión. The total journey from La Rioja is 272 Km on tarmac. From Córdoba, it’s 580 Kms, also fully on tarmac. 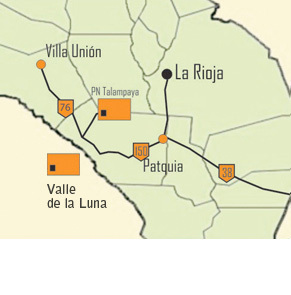 From Chilecito (Province of La Rioja), take national route 40 and drive to Nonogasta, then follow signs towards Villa Unión. The total journey is 100 Km on a good tarmac road. From the city of San Juan, take route 40. It's a 330 Km journey on tarmac. Cañón de Talampaya Hotel is located in Villa Unión, on the main entrance roadway, exactly at kilometre 272, on the left-hand side (if approaching from Talampaya National Park).